the first thing we’re asking the script to do is place the names of all of InDesign’s current printer presets into a variable which we’ve called mgPresetList. having studied lesson 03 you’ll know that the variable can be called anything you like, as long as it doesn’t clash with standard applescript terminology. mgPresetList is a list of names being generated by InDesign every time the script is run. 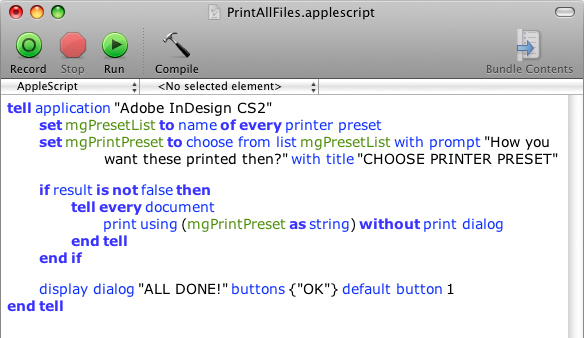 if printer presets are added or deleted in InDesign, the list will change next time the script is run. ok, that’s a quick introduction to lists. we’ll look at other things you can do with lists in future lessons. next — the choose from list command. this command is an example of a user interface — a way for the script to interact with the user (you) during the running of the script. sometimes user interfaces get input from the user, as in this case. sometimes they merely communicate with the user, as in the display dialog command at the end of the script. this is mostly a matter of style. placing data into variables is a good way to keep track of things when you’re starting out. please yourself. the mgPrintPreset variable will contain the result of the choose from list command. there are other ways to capture the result of this command, but “set [VariableName] to …” is the easiest. in the next lesson we’ll look at another important aspect of this script — error handling. so many important elements packed into one simple little script aren’t there?